Running Press Kids, 9780762459865, 40pp. Roar is worried about his first day at school. He's worried that he'll have to do really hard things, like molt his scales and fly over a volcano. And what if his teacher doesn't like dragons? 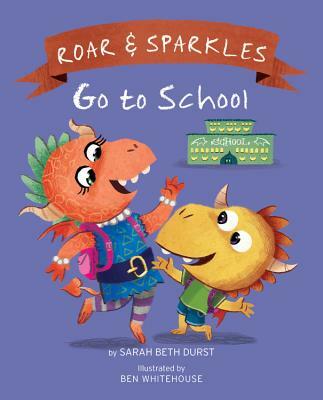 Roar and Sparkles Go to School is a sweet story about the anxieties children may feel about attending school for the first time, as well as a comforting tale about the bond between siblings. Sarah Beth Durst's imaginative and playful script is enhanced by Ben Whitehouse's modern and fresh illustrations to create a book that's sure to squelch first-day-of-school worries for children. Sarah Beth Durst is the author of nine fantasy novels for children, teens, and adults. She was awarded the 2013 Mythopoeic Fantasy Award for Children's Literature and has been a finalist for SFWA's Andre Norton Award. Ben Whitehouse is an illustrator born and raised in Birmingham UK. He recently lived in Vienna, Austria for a year, but is now back in the UK and based in Bourne, Lincolnshire, where he lives with his lovely girlfriend, Yvonne, and their crazy border collie named Sparrow. Ben has previously worked in the animation industry as a character designer, animator, and stop motion puppet maker before finding his feet within the world of illustration.